Michael Frye, founder of British Heritage Chauffeur Tours, is one of those lucky people who has been able to enjoy two vastly different professions. For twenty years he was one of the principals of the London Symphony Orchestra, where he had the honour of meeting Stravinsky, and performing with musicians as diverse as Herbert Von Karajan, Bernstein and John Williams. He was able to balance his classical career with the world of pop, recording with the likes of Sir Paul McCartney, Sir Elton John, The Who, Barbara Streisand, Frank Zappa and many, many more. It was whilst travelling the world as a musician that Mike realised that his homeland had more history and heritage than most of the other places he was seeing and, wanting to share its treasures with others, British Heritage Chauffeur Tours was born. Meet our clients at their hotel to introduce myself – although usually by the time we meet they already feel like part of the family! Then I might take them to experience the history of Hampton Court Palace followed by lunch at The Carnarvon Arms which is five minutes from Highclere Castle where a magical afternoon can be spent before going on to the ‘living film set’, Lacock. Possibly on to Stonehenge and historical Bath, finishing at the Royal Crescent for dinner. The great thing about my job, however, is that a day can be turned completely on its head if something in particular captures the clients’ interest. Very recently, for example, after spending the morning at Highclere Castle we didn’t make it beyond The Carnarvon Arms, as the American couple I was with said that if I didn’t mind they were so fascinated by my musical background they just wanted to sit and talk to me for the afternoon! Although I’m not as old as Stonehenge – apparently equally fascinating!! I just love the people I meet in my job. Nothing delights me more than seeing the excitement and wonder on the faces of my clients when I take them to a place that I know so well and being able to make a reality something that the vast majority of them have only read about or seen on TV and in films. Their reactions never cease to amaze me. For instance, on a recent trip to Highclere Castle, the lady I was driving asked me to stop at the gates and handed me a CD to play. As I drove through the gates I realised that it was the theme tune to Downton Abbey that was playing. I glanced in the rear view mirror and saw that she had tears running down her cheeks – obviously a great fan of the series! One of my real favourites is Les Rosees – a wonderful private boutique hotel in Mougins. It is such a hidden gem that offers both authenticity and tranquillity despite being so close to Cannes, and it is a firm favourite with the likes of Liza Minnelli, Robert de Niro and the late Whitney Houston. In complete contrast to Les Rosees, is the Encore in Las Vegas – simply WOW, and finally although I was there a long time ago I was privileged to be a guest of the Sultan of Oman at the newly built Al Bustan Palace. Probably the most memorable dining experience to date is actually a missed dinner date that my wife Pam will certainly never let me forget! I had the pleasure of driving Kevin Costner for three months whilst he was filming Robin Hood Prince of Thieves. One Saturday, I had the night off and was looking forward to spending it with my family. The phone rang and it was Kevin, who said that he was going out to dinner with Tom Conte and Tom Cruise and would I like to join them? I thanked him but declined explaining that I was looking forward to spending a relaxing evening with Pam. Kevin suggested that Pam come along as well but it had been a long week and I said no. Well, you can imagine what sort of evening mine turned out to be when I told Pam about the conversation. She didn’t speak to me for a week and still reminds me of it whenever we see any of them on TV! My musical career has meant that I have been fortunate to spend my life working alongside the rich and famous. 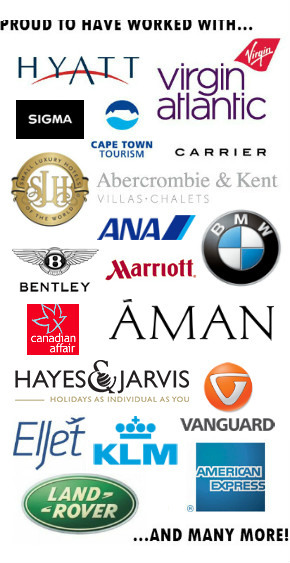 Since forming BHC Tours I have had the privilege of meeting and becoming friends with so many of the world’s high profile individuals and their families that discretion forbids me to name any of them. Having spent twenty-two years of my life travelling the world as a musician, my wife finds it increasingly difficult to get me to leave the country now. My wish list is fulfilled and there are so many wonderful places to visit in the UK that will keep me satisfied forever. Thank you for taking part in our interview, Michael. Although I still like to travel overseas, living between the Lake District and the Yorkshire Dales, I can totally appreciate what you say about there being so many places beautiful places on our shores still to visit. Saw this and just wanted to add that Mike & Pam kindly organised an amazing night in London as part of a family extravaganza with the best seats at the Festival Hall! Nothing too much trouble and we all came away feeling like royalty for the occasion. Very special memories – thank you for keeping on making them happen. Special business built upon the people & passion . We had a wonderful day with Michael. On our way to visit Blenheim Palace & Waddesdon gardens, Michael stopped in Oxford to show us all the sites the university city has to offer including the Harry Potter dining hall at Christ Church. Walking around the ancient city with Michael as our guide was the best part of the day. Thank you for a memorable vacation. Through my business, we use many chauffeur companies throughout the country, taking artists from venue to venue. Having used several of the leading chauffeur companies in London, for the last two years, we have chosen to only use Michael’s. It’s the small touches that make the difference, combined with the value for money. I highly recommend this company… and if you’re extra lucky, you’ll get a driver called Andy. My wife and I enjoyed a wonderful 3 days in London with Mike as our personal guide. He really took the time to learn as much as he could about what we wanted to see and the kind of trip we were looking for. Everything from his suggestions for our itinerary and the best seats at the theatre, to choosing from reservations at 3 or 4 of London’s best restaurants every night, was bespoke to the highest degree. We felt so pampered, that we started calling ourselves the “Duke and Duchess”! Mike and his company set a standard of service and personal attention that we may spend the rest of our travelling lives looking to equal. A return to London and BHC Tours is definitely in our plans. This Fall, we had the distinct pleasure to engage ‘British Heritage Chauffeur Tours’, Mr. Frye, his invaluable administrator Pam et company, to experience their rare blend of professionalism, hospitality, engaging tours as well as their gracious hotel and fine dining recommendations. They offer everything that one could desire in a tour, with the utmost flexibility. From small thoughts, such as frequently asking if we were comfortable while in their spacious Mercedes – to offering a sporty tour of the countryside in a Jaguar – to being welcomed like Kings at famous castles (the only car allowed to the entrances) – to touring with the security and privileges of Heads of State in a Rolls, Phantom…. We found no other tour service that offered the same uncompromising standards. Mr. Frye and his impressively qualified team transformed a rudimentary travel sketch into a lifetime of heartfelt memories. We consider him to be one of Britain’s finest “Ambassadors”. Congratulations to BHCT. BHCT gives attention to detail beyond any other service I have ever experienced in life. A London experience without Michael is not a London experience. Fantastic interview, we can’t recommend Michael enough! One of the gems of the industry and a wonderful person as well. The company has an unique approach and offers a very high end and friendly service and you will not have the chance to meet someone with such a diverse, rich and interesting background very often! Best wishes from the Five Star Magazine & Media Team. Great interview! I am happy to read that I have stayed in two of his three favourite hotels. I feel honoured! Great interview – thank you! It’s great that he wants to share his experiences with other people. He’s worked with amazing people! It sounds as though it must be a great tour. It sounds like Michael Frye knows some amazing places, I bet they are fabulous tours! From the comments, they sound very luxurious and enjoyable. His musical career must have been so exciting too! Thanks for posting this interview. Wow, what a great story. It sounds like Michael has had some fantastic experiences. I bet the tours are fab! I’d love to hear more about his musical career.